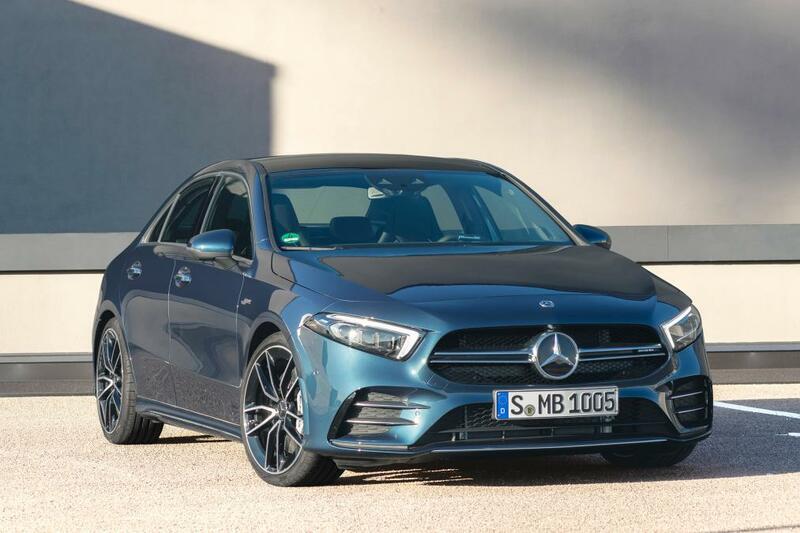 Following the Hot Hatch, the next level of driving performance is here: the A 35 4MATIC Saloon is the second model from Mercedes-AMG based on the new compact car platform and the first choice for customers looking for the sportiness typical of the brand combined with a comfortable amount of space for passengers and luggage. 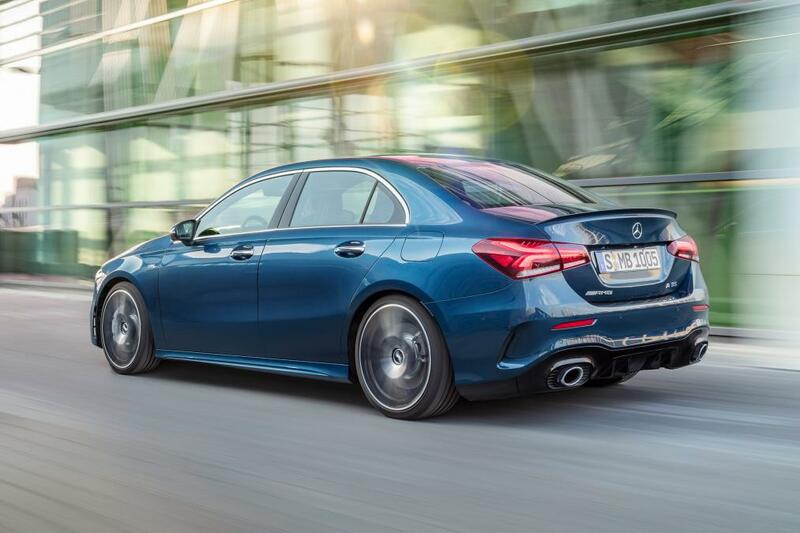 The new A 35 4MATIC Saloon expands the current AMG model range by an additional attractive entry-level model. It appeals to young target groups who are looking for a high level of performance and a comfortable amount of space for passengers and luggage. An acceleration time of 4.8 seconds for 0–100 km/h and the top speed of 250 km/h (electronically limited) meet these customers’ requests for high driving dynamics also in the compact segment. 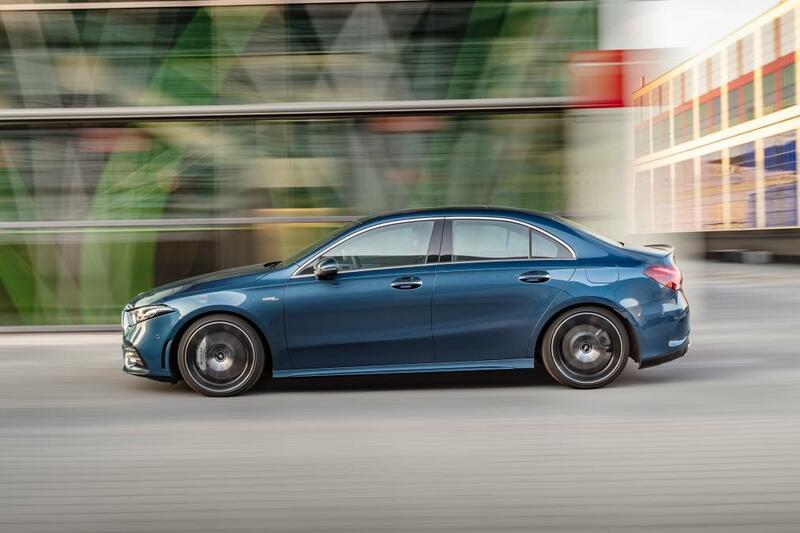 The 2.0-litre four-cylinder turbo engine boasts a spontaneous response to accelerator pedal commands, high tractive power, a supremely lively response and an engine sound typical of AMG. The crankcase made of high-strength, lightweight die-cast aluminium reduces the vehicle weight where it matters most for driving dynamics. A twin-scroll turbocharger is used for turbocharging. It combines optimum responsiveness at low engine speeds with a strong power increase at higher speeds. The housing of the twin-scroll turbocharger is divided into two parallel ducts. Together with two separate exhaust ducts in the exhaust manifold, this makes it possible to channel the exhaust gases separately on the turbine wheel. This minimises the mutual negative influence of the individual cylinders in the charge change cycle. This reduces the exhaust backpressure and improves the charge change as well as the efficiency of the engine. The exhaust system features an automatically controlled exhaust flap as standard. Depending on the drive programme selected the sound is modulated from balanced to powerful. 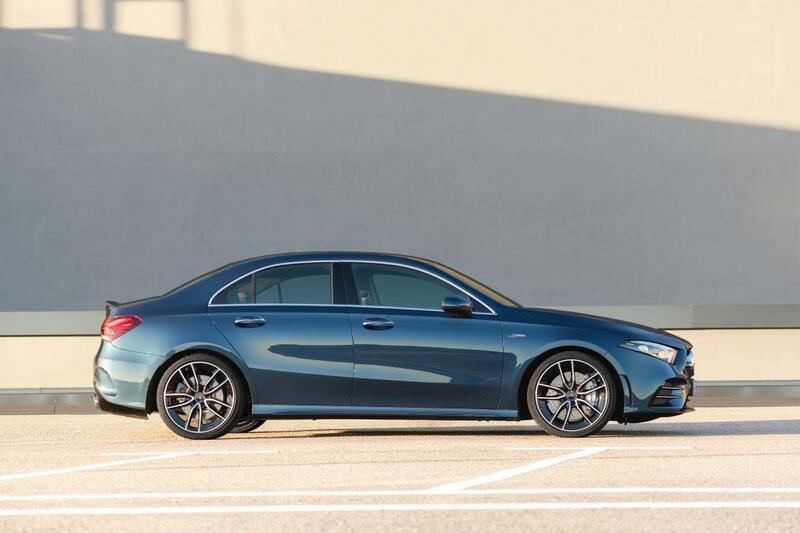 The front axle of the AMG suspension features a McPherson suspension strut construction. Suspension is taken care of by one wishbone below the wheel centre, one spring strut and one tie rod respectively. The special axle geometry reduces the influence of the drive on the steering, the new wishbone in aluminium reduces the unsprung masses. The AMG-specific front steering knuckle has a radially bolted brake calliper – a technology originating from motorsport. The 4-link rear axle is connected rigidly with the body via a subframe. Three transverse arms and the trailing arm, the wheel carrier and the bearings from the proven A 45 4MATIC are used on each rear wheel. This ensures maximum driving stability and agility. Dynamism, agility and performance – these three attributes characterise the standard all-wheel drive of the new AMG A 35 4MATIC Saloon. 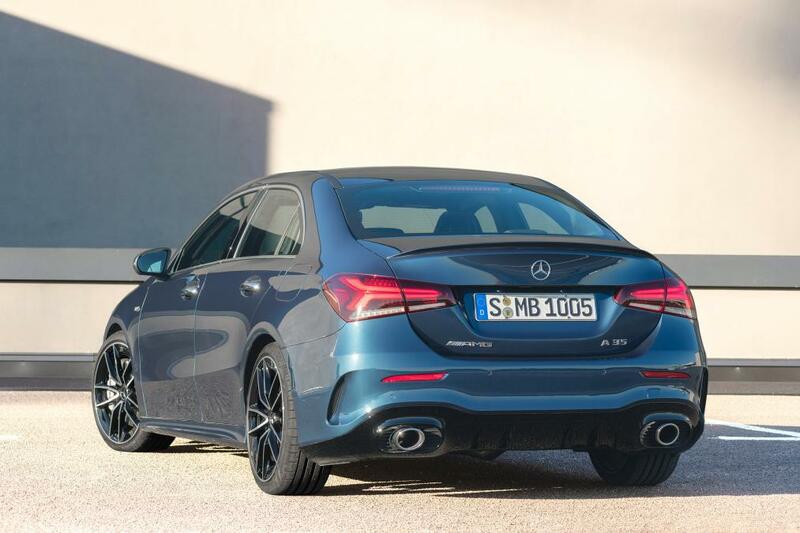 The variable AMG Performance 4MATIC combines the best possible traction with lots of driving fun. The torque distribution is infinitely variable to suit the dynamic handling requirements. The spectrum ranges from front-wheel drive only to a 50:50 percent distribution to the front and rear axles. A multi-disc clutch that is integrated in the rear axle transmission is responsible for the variable torque distribution between the front and rear axles. It is controlled electro-mechanically. The influencing factors for torque distribution are not only the driving speed, the lateral and longitudinal acceleration and the steering angle, but also the difference in rotational speed between the individual wheels, the gear selected and the accelerator position. The main advantages of electro-mechanical control over an electro-hydraulic system relate to sharper driving dynamics – primarily due to the significantly faster response and speed-independent actuation of the discs over the entire adjustment range.